Jasimuddin Rahmani is a Bangladeshi radical Islamist cleric and spiritual leader of Ansarullah Bangla Team (ABT), a banned terrorist organization in Bangladesh.Vidhi Doshi, “Authorities in Bangladesh say Manhattan bombing suspect was self-radicalized,” Washington Post, December 13, 2017, https://www.washingtonpost.com/world/asia_pacific/authorities-in-bangladesh-say-manhattan-bomber-wasself-radicalized/2017/12/13/b58cebb8-debf-11e7-b2e9-8c636f076c76_story.html. In February 2013, a secular activist and blogger was killed by a group of students in a machete attack in Dhaka. Two other bloggers were murdered in a similar manner in the subsequent months.Geeta Anand and Julfikar Ali Manik, “Bangladesh Says It Now Knows Who’s Killing the Bloggers,” New York Times, June 8, 2016, https://www.nytimes.com/2016/06/09/world/asia/bangladesh-killings-bloggers.html; Agence France-Presse, “Two sentenced to death for Bangladesh blogger murder,” Guardian, December 31, 2015, https://www.theguardian.com/world/2015/dec/31/two-sentenced-death-bangladesh-blogger-ahmed-rajib-haider. ABT was implicated in the attacks, and the students involved were allegedly inspired by Rahmani’s sermons, which called for the deaths of individuals opposed to Islam.“Bangladesh bans Islamist group accused of blogger attacks,” BBC News, May 25, 2015, http://www.bbc.com/news/world-asia-32879662; Geeta Anand and Julfikar Ali Manik, “Bangladesh Says It Now Knows Who’s Killing the Bloggers,” New York Times, June 8, 2016, https://www.nytimes.com/2016/06/09/world/asia/bangladesh-killings-bloggers.html; Agence France-Presse, “Two sentenced to death for Bangladesh blogger murder,” Guardian, December 31, 2015, https://www.theguardian.com/world/2015/dec/31/two-sentenced-death-bangladesh-blogger-ahmed-rajib-haider; Jufilkar Ali Manik, “Preaching militancy, building network,” Daily Star (Dhaka), August 14, 2013, http://www.thedailystar.net/news/preaching-militancy-building-network. Rahmani was arrested in August 2013 and convicted in December 2015 for his role in inciting the murders.Jufilkar Ali Manik, “Preaching militancy, building network,” Daily Star (Dhaka), August 14, 2013, http://www.thedailystar.net/news/preaching-militancy-building-network; “Court accepts charges against ABT chief, 9 others,” Daily Star (Dhaka), November 9, 2016, http://www.thedailystar.net/city/court-accepts-charges-against-abt-chief-9-others-1311745. He was sentenced to five years in prison.“Court accepts charges against ABT chief, 9 others,” Daily Star (Dhaka), November 9, 2016, http://www.thedailystar.net/city/court-accepts-charges-against-abt-chief-9-others-1311745. Reportedly inspired by the teachings of al-Qaeda in the Arabian Peninsula (AQAP) radical cleric Anwar al-Awlaki, Rahmani began to propagate his own radical views in Bangladesh since at least 2007, through speeches, publications, and online communications. Around 2008, he began to construct a radical Islamist network called the Ansurallah Bangla Team (ABT) that operated in small cells across the country. ABT’s membership was reportedly largely composed of wealthy university students, and the group’s ultimate objective was to establish Islamic rule in Bangladesh.Jufilkar Ali Manik, “Preaching militancy, building network,” Daily Star (Dhaka), August 14, 2013, http://www.thedailystar.net/news/preaching-militancy-building-network. In addition to organizing and leading ABT, Rahmani was also a leader at a mosque in Dhaka, the capital city of Bangladesh.Agence France-Presse, “Two sentenced to death for Bangladesh blogger muder,” Guardian, December 31, 2017, https://www.theguardian.com/world/2015/dec/31/two-sentenced-death-bangladesh-blogger-ahmed-rajib-haider. On February 15, 2013, Ahmed Rajib Haider, a secular activist and blogger critical of Islamic fundamentalism was hacked to death with a machete by a group of students from North South University in Dhaka. Two more so-called “atheist bloggers” were killed in a similar manner in the following two months. The assailants had regularly listened to Rahmani speak at their local mosque, and had allegedly been inspired by his sermons. During his sermons, Rahmani had decreed a fatwa on bloggers who criticized Islam, preaching that it was legal––and necessary––for them to be killed.Geeta Anand and Julfikar Ali Manik, “Bangladesh Says It Now Knows Who’s Killing the Bloggers,” New York Times, June 8, 2016, https://www.nytimes.com/2016/06/09/world/asia/bangladesh-killings-bloggers.html; Agence France-Presse, “Two sentenced to death for Bangladesh blogger murder,” Guardian, December 31, 2015, https://www.theguardian.com/world/2015/dec/31/two-sentenced-death-bangladesh-blogger-ahmed-rajib-haider; Jufilkar Ali Manik, “Preaching militancy, building network,” Daily Star (Dhaka), August 14, 2013, http://www.thedailystar.net/news/preaching-militancy-building-network. On August 12, 2013, Rahmani and 30 of his followers were arrested for their alleged involvement in the killings.Jufilkar Ali Manik, “Preaching militancy, building network,” Daily Star (Dhaka), August 14, 2013, http://www.thedailystar.net/news/preaching-militancy-building-network. 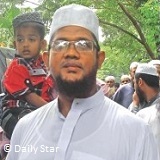 On December 31, 2015, Rahmani was found guilty of inciting the murder of Ahmed Rajib Haider through his radical sermons and was sentenced to five years in prison.“Court accepts charges against ABT chief, 9 others,” Daily Star (Dhaka), November 9, 2016, http://www.thedailystar.net/city/court-accepts-charges-against-abt-chief-9-others-1311745. Investigations implicated ABT in all three of the murders, and on May 25, 2015, Bangladesh officially banned the group.“Bangladesh bans Islamist group accused of blogger attacks,” BBC News, May 25, 2015, http://www.bbc.com/news/world-asia-32879662. On November 8, 2016, additional charges were filed against Rahmani under Bangladesh’s Anti-Terrorism Act for planning to take control of territory and wage violent jihad in the country.“Court accepts charges against ABT chief, 9 others,” Daily Star (Dhaka), November 9, 2016, http://www.thedailystar.net/city/court-accepts-charges-against-abt-chief-9-others-1311745. Akayed Ullah, the Bangladeshi U.S. immigrant who carried out an attempted suicide bombing in a New York City subway passageway on December 11, 2017, was reportedly inspired in part by the writings and online sermons of Rahmani.Tracy Connor, “Akayed Ullah hears charges in NYC subway bombing from hospital bed,” NBC News, December 13, 2017, https://www.nbcnews.com/news/us-news/akayed-ullah-hears-charges-nyc-subway-bombing-hospital-bed-n829346; Vidhi Doshi, “Authorities in Bangladesh say Manhattan bombing suspect was self-radicalized,” Washington Post, December 13, 2017, https://www.washingtonpost.com/world/asia_pacific/authorities-in-bangladesh-say-manhattan-bomber-wasself-radicalized/2017/12/13/b58cebb8-debf-11e7-b2e9-8c636f076c76_story.html. Jashim Uddin RahmaniAgence France-Presse, “Two sentenced to death for Bangladesh blogger muder,” Guardian, December 31, 2017, https://www.theguardian.com/world/2015/dec/31/two-sentenced-death-bangladesh-blogger-ahmed-rajib-haider. Jasim Uddin RahmaniGeeta Anand and Julfikar Ali Manik, “Bangladesh Says It Now Knows Who’s Killing the Bloggers,” New York Times, June 8, 2016, https://www.nytimes.com/2016/06/09/world/asia/bangladesh-killings-bloggers.html. Muhammad Jasimuddin RahmaniTamanna Khan and Subir Das, “Progressive force its prime target,” Daily Star (Dhaka), August 14, 2013, http://www.thedailystar.net/news/progressive-force-its-prime-target.